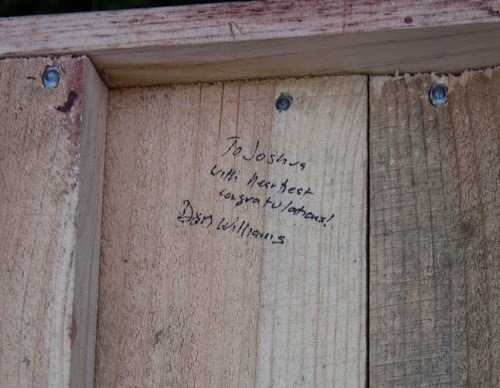 The first time I met Don Williams was seven years ago when he guest lectured at the National Institute of Wood Finishing where I was a student. We had crossed paths a few times since but it wasn’t until the past year or two that our friendship had grown much beyond casual acquaintance. Though I’ve been down to his place a couple times and he’s been up here before, our wives hadn't met each other yet. This past weekend that changed. Don and his wife, Carolyn, came up for a quick New England research trip. We were fortunate enough to have them crash at our place a couple of nights. The ladies hit it off right away. We all had a really great time of conversation, fellowship, and entertainment. Carolyn was interested in the Fisher House, so I took them through on Friday. The last time Don was up I had barely begun my research. His response to what’s been uncovered since that visit was encouraging to say the least. Saturday we made our way up to the Common Ground Fair in Unity, ME. We are all homesteader junkies so this was pretty amazing. 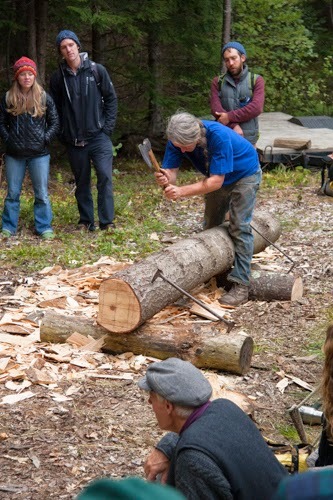 Don and I spent most of our time looking at wood craft demonstrations like spring pole turning, hand hewing timbers, etc. The ladies spent time with textiles, animals, wagon ride, and such like. Sunday morning, the Williams’ joined us for worship at our church, Pilgrim Orthodox Presbyterian Church in Bangor, ME. Our pastor is working through Proverbs right now. I am particularly enjoying this series. After lunch, they had to move on to their next stop. We had such a great time talking goats, firewood, veggies, fermentation, church, tools, furniture, etc. Thanks Don and Carolyn for being so generous to us throughout the weekend. We had such a great time. Great story of your time together. GOD is good ! Life is Good ! Amen, Bartee. Glad you enjoyed the post. Thanks for commenting!